0Publisher's Note: Products purchased from Third Party sellers are not guaranteed by the publisher for quality, authenticity, or access to any online entitlements included with the product. Get the most out of the iWork suite of apps on a Mac, an iOS device, and in iCloud. 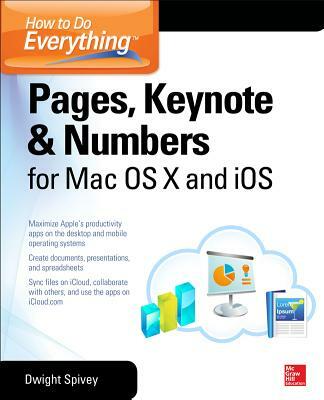 How to Do Everything: Pages, Keynote & Numbers for OS X and iOS shows you how to create great-looking documents, persuasive presentations, and number-crunching spreadsheets. Filled with clear explanations and detailed examples, this practical guide covers everything you need to know to use these powerful productivity apps on your Mac, iPad, iPhone, iPod touch, and web browser.